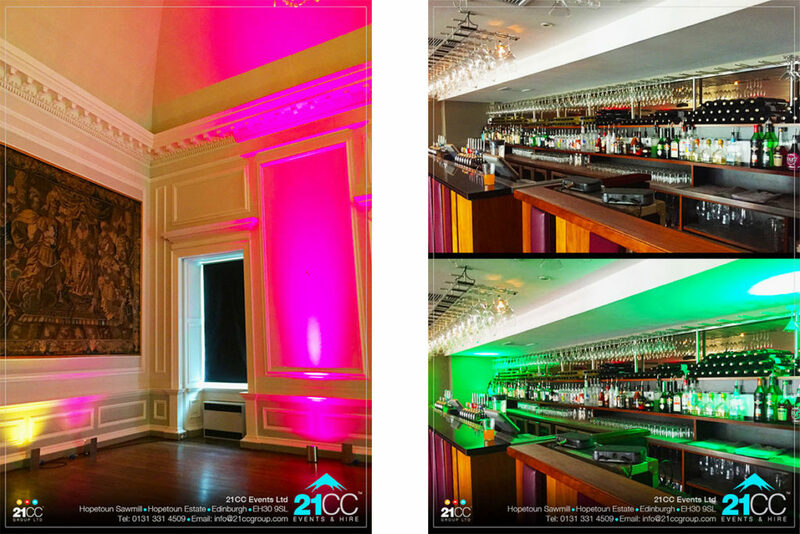 Light up your event, festival, venue or wedding in the colours of your choice with event lighting from 21CC Events! Our lights can be used indoors or outdoors for optimum effect. They are all wireless units powered by powerful lithium ion batteries, meaning no untidy cables or wires for guests to trip on! Our lights are built using new super-bright LEDs, all of which are RGBW. This means that we have a full spectrum of colours, so you can have your room, venue or gardens lit up just the way you want them – including corporate or wedding day colours. The conventional method of up-lighting to venues and marquees is by using Par38 bulbs. These are relatively low powered and they get very hot. With our lighting all being LED, they do not get hot like conventional bulbs, reducing fire risk or the risk of guests hurting themselves on hot bulbs at floor level. Not only do our lights remain cool to touch, they are super bright and many times more powerful than conventional Par38 lighting. 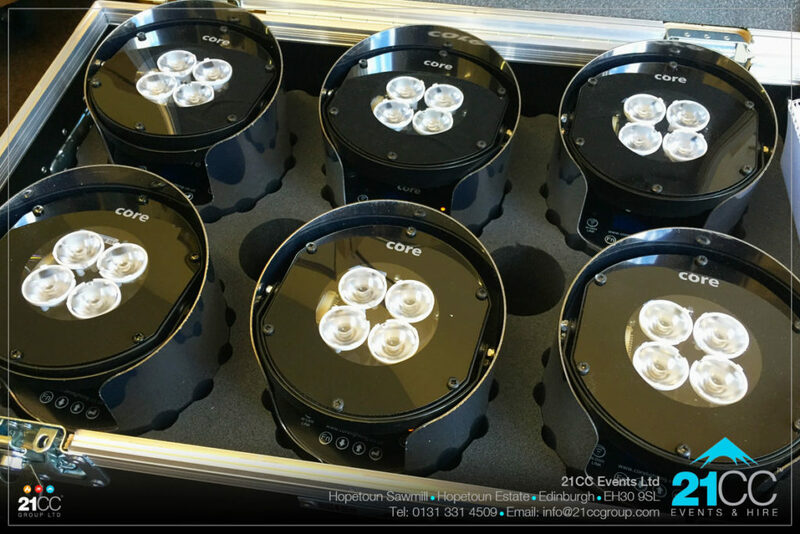 See the image below to show one of our super-bright lighting units compared to 2 of the older Par38 lights. Light up the inside of your venue, room, theatre or marquee with our feature event lighting. They are perfect for the job. Why not have them set to a warm, mellow light during the day for meeting and dining then have them change to a strong purple, pink and deep royal blue to set the scene for the evening entertainment. 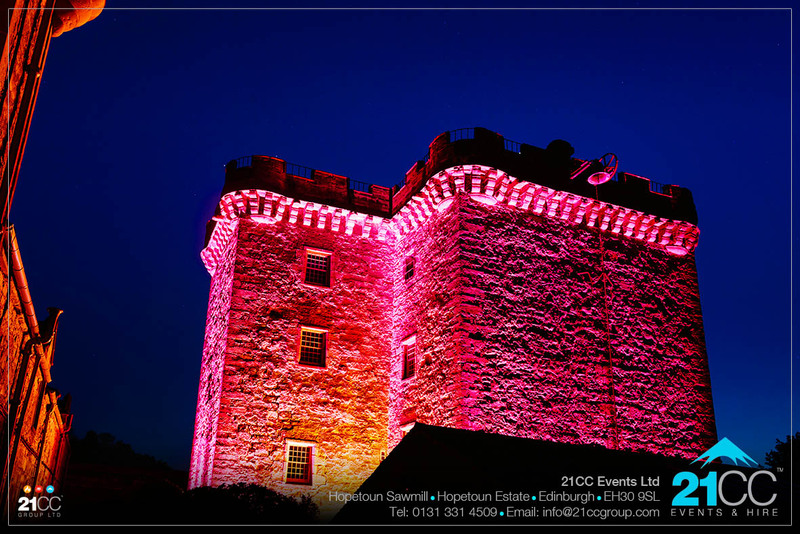 Make an impression at your event and light up the frontage to your venue with some stunning colours as your guests arrive and mingle throughout the evening. 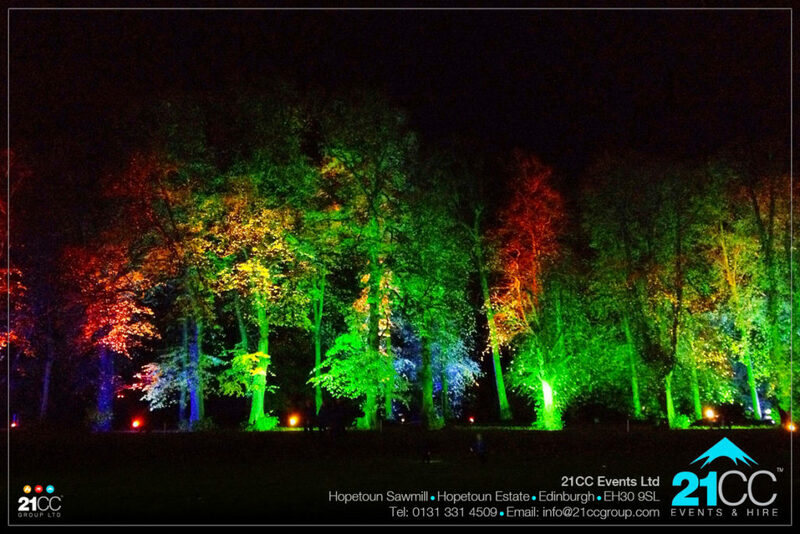 As well as lighting up the outside of your venue, our lights can be used really effectively to light up the surrounding gardens, trees, driveways and features. Our lighting is available for hire to event professionals. 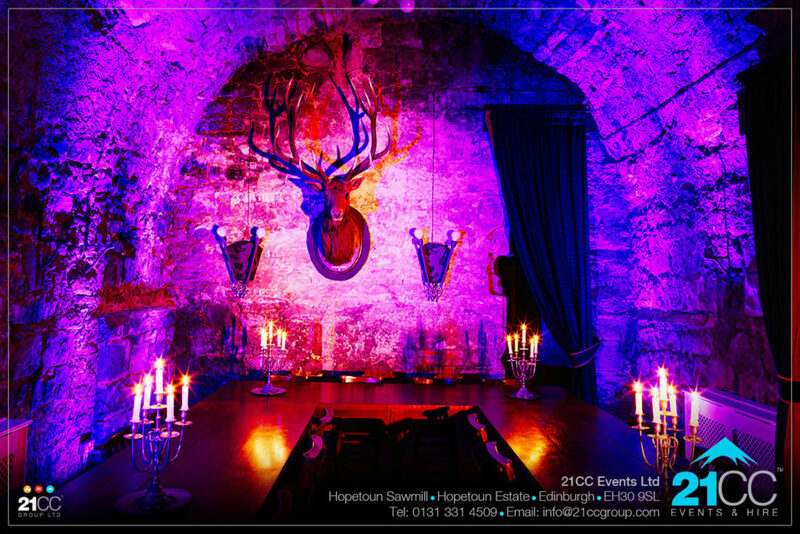 Contact our hire team on hire@21ccgroup.com or call the events office on 0330 022 1711. 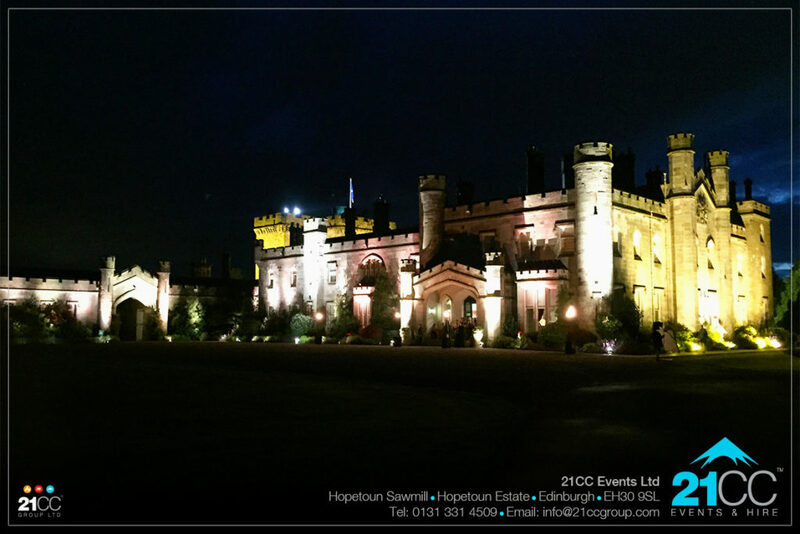 Check out our event pages for more information on 21CC Events Ltd. Also have a look at our event lighting pages for more photos of our lighting in action. #eventlighting #21ccevents. Thank you.